This article is about the species known as Crab. For other uses of the word Crab, see Crab (disambiguation). Crabs are a species of animals found in a few Mario games. They are often portrayed in either the same way as their real-life counterparts or as enemies. In the Donkey Kong Country television series episode Get a Life, Don't Save One, Dixie Kong owns a pet crab named Crabby. It is never actually seen on-screen (likely owing to the show's poor modeling budget), but it causes large amounts of havoc in the episode regardless. In Mario Kart 64, crabs can be found in Koopa Troopa Beach where they walk left and right. Driving over one will make the player spin around. Sidesteppers replace crabs in later installments. In the Donkey Kong Country remakes for Game Boy Color and Game Boy Advance, Donkey and Diddy Kong may encounter a crab during a challenge at Funky's Fishing. The crab has no effect on the Kongs' score, but if they can succeed in hooking it, they will earn themselves a special Photograph from Funky Kong. It scurries across the bottom of the water rather quickly, and appears randomly, so the Kongs should always keep an eye out for it. Once the crab is caught, it will never appear again. In Mario & Luigi: Dream Team, hermit crabs appear as the main focus of the Mole Hunt game, where they must be dug up using the Mole Mario technique. Small crabs appear as wildlife in certain kingdoms in Super Mario Odyssey, specifically the Lake Kingdom, the Seaside Kingdom, and the Mushroom Kingdom. In the Lake and Mushroom Kingdoms, they are pink, and in the Seaside Kingdom, they are yellow. Like most ground-based wildlife in the game, following them for an extended period causes them to disappear in a puff of smoke, often leaving behind a coin. 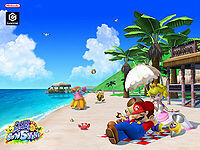 In Super Mario Sunshine one of the islands neighboring Isle Delfino is shaped like a crab. It is seen in the opening cinematic. A normal crab is visible on one of the game's group artworks, but is not present in-game. This page was last edited on January 22, 2019, at 03:41.